The past few weeks, my family has had the privilege of diving into the best that hands on American History has to offer by partnering with American Heritage Chocolate. Two weeks ago, I was transported to all the historic beauty that Thomas Jefferson poured into Monticello (read about it here) and last weekend, five of the seven of my clan were stirred, convicted, encouraged and educated on the inspirational mark that George Washington made by setting such a strong precedence of character to the first presidential position. What impacted me most was that the titles of victorious general of the American Revolution or the first President of the United States were not what defined him. He was a humble man who guarded his reputation. He knew that the decisions he made and the precedent he set came with uncharted territories and they would impact America’s future. When others begged him to become King, he denied their plea. He had the vision to return the power to the people, while other key leaders throughout history chose dictatorship. He considered this the Grand Experiment. He knew that his role was not just about being the first president, but about the second and third and how the transition of power was handled. 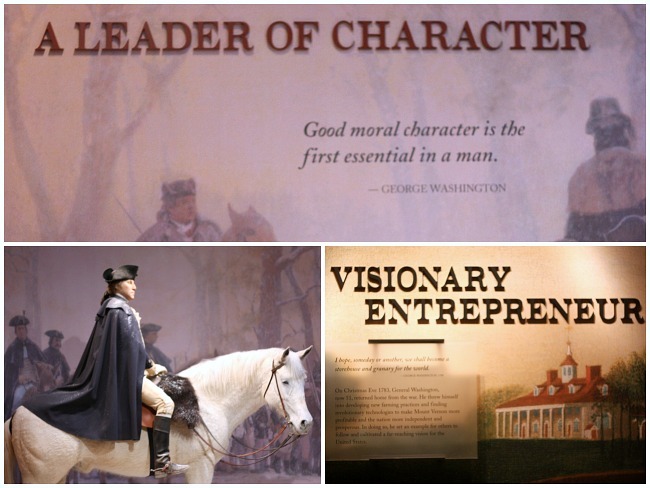 The home of George Washington, Mount Vernon, is an educational experience like no other. 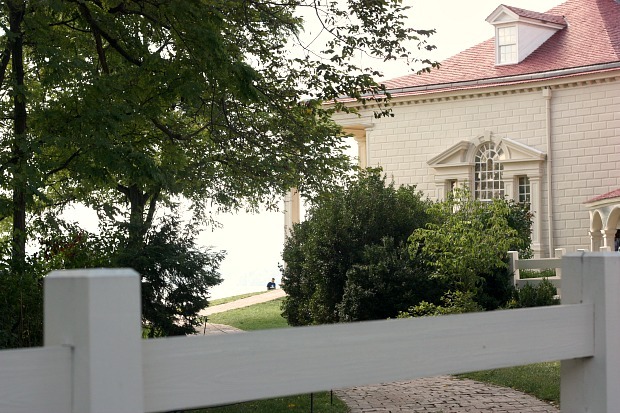 Not only is the view breathtaking as you look out on the Potomac River, but the newly added Educational Center and Presidential Library can not be matched with the thorough hands on experience that it offers. Both at Monticello and Mount Vernon, I was profoundly impacted by the fact that their researchers are continually uncovering new historical facts about the lives of our presidents and their families. 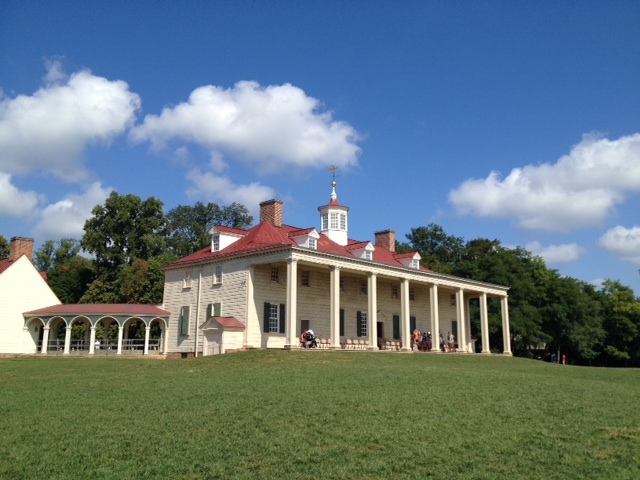 One of the most noted differences is the color of Mount Vernon. For years, it’s been portrayed as a white home, but as of three years ago, they unearthed facts that led them to alter to shade just slightly making it more historically accurate. While all the decorating bones in my body cry out to keep the white, I so appreciate the fact that they need to stay authentic to their findings. The same happened in this beautiful room above. 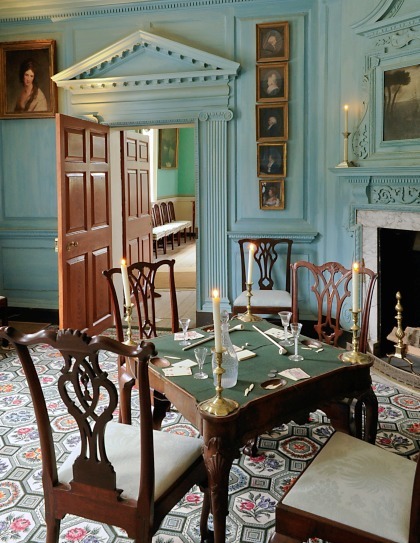 If you visited Mount Vernon over the last few decades, this room has always been the formal dining room. In fact, the coffee table book we own shows it with a long dining table, but again, as new letters and architectural facts were brought to light, they realized this was not used as a dining room, but as a parlor and gathering place for guests. 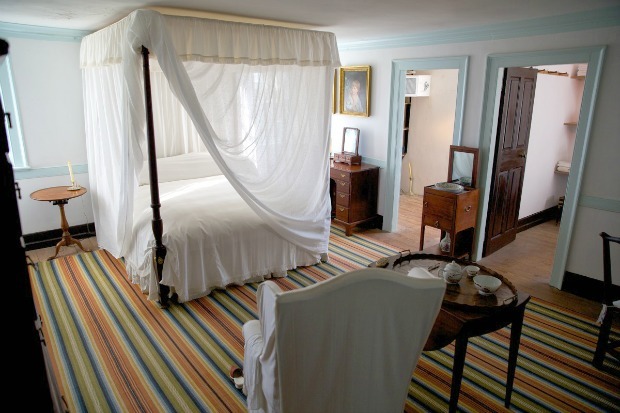 This is Mr. and Mrs. Washington’s private bedroom. This is not typically open to the public, so we were privileged to be able to see it. 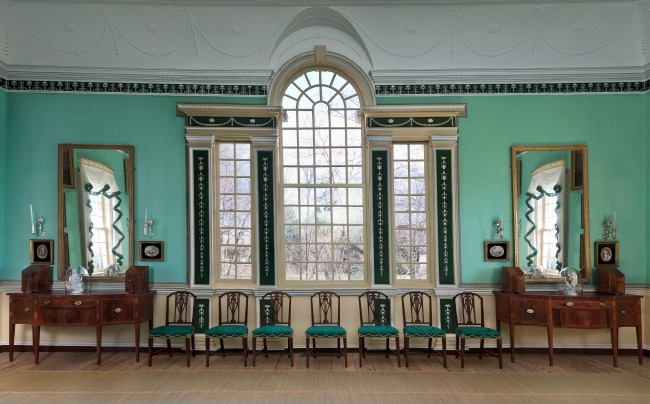 It’s interesting to note that when President Washington passed away, his wife closed up this room, never to enter into it again. Those rocking chairs overlook the Potomac River which was a key waterway during his time. Do you see that really tall portico? I climbed all the way up there and then got a little nervous on the tiny ladder and came quickly down. 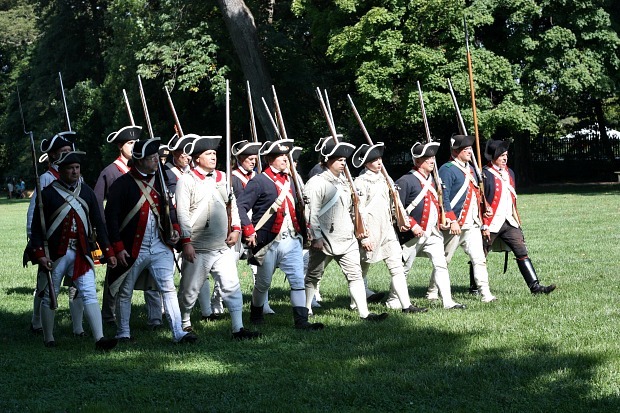 We were able to view a re-enactment while we visited Mount Vernon. Since I actually live near a Revolutionary way battle site, I’ve been able to watch a battle before, but it never gets old. Taking us back in time to realize just how much our forefathers sacrificed so we could have the freedom we do right now is always sobering. While I never really thought of George Washington and his slave ownership, it was interesting to find out his view on the subject of slavery shifted over the course of his life. 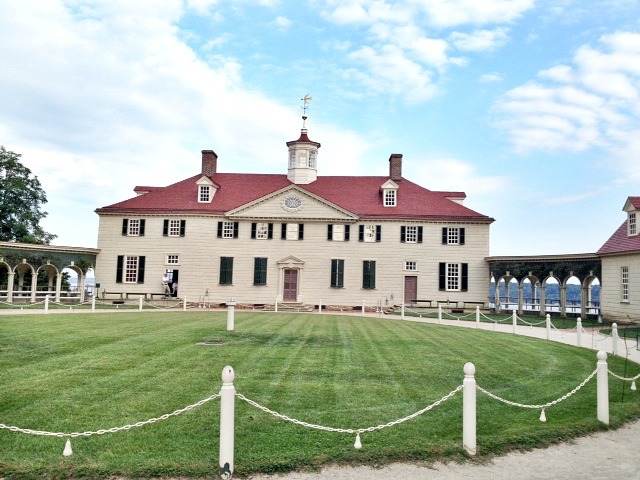 His view had a profound affect on those that came after him and you read just how that occurred at the Mount Vernon site. One of the very fun opportunities I’ve had is learning so much about the history of chocolate and especially just how my idea of chocolate varies greatly from the chocolate that our presidents so greatly enjoyed. In fact, I’m appreciating every little bit of chocolate that I eat these days because I realize that so much history, research and development goes into every bite that we eat. At historical sites throughout the country, Mars Chocolate company set about to educate consumers on the history of chocolate. 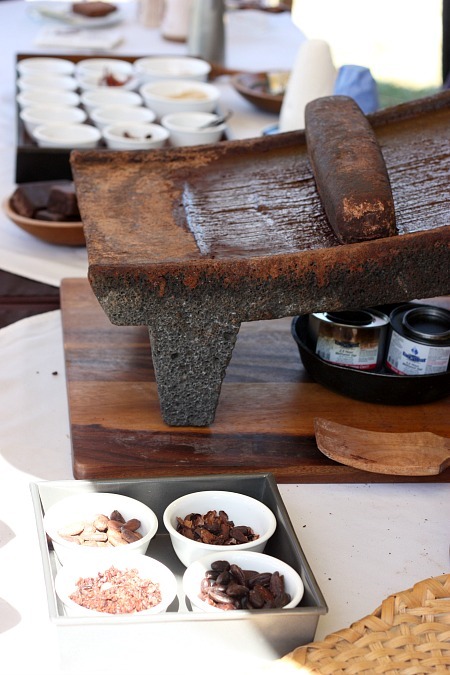 From their many years of chocolate research and history, we’ve found out so much about how it was enjoyed during the colonial times. In fact, their website has a fascinating time line about chocolate history that your kids would enjoy. Do you see the cocoa pod above? 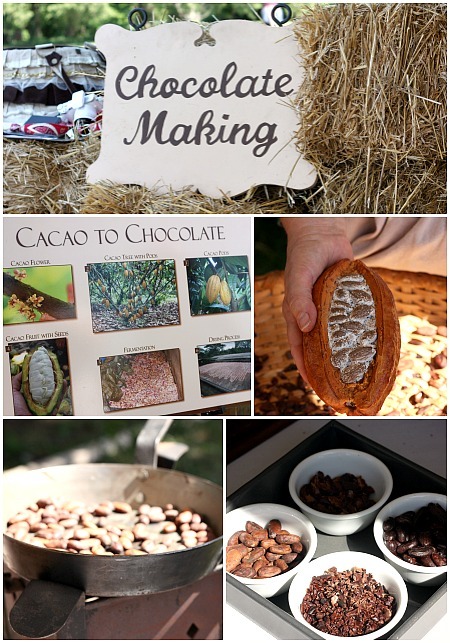 Did you know that it takes one pod, yes, one WHOLE POD, which has around 30 cocoa beans, just to make one bag of M&M’s? Isn’t that amazing? There are approximately 5 million Cocoa farmers throughout the world and Mars is committed to assisting and educating those farmers in the proper techniques of growing cacoa plants. I don’t know about you, but I am incredibly thankful to them for that. They know that as the farmers become more knowledgeable, it helps us all. If you’re trained in music, you know that if a note in a chord is missing, it might still sound nice, but definitely not as good as it could sound with the full chord. That’s why it took them years to figure out all the spices that the colonists would have used in their chocolate. I explained a little more about the process in my post about Monticello. It’s so fascinating. When you visit any of the participating historical locations, make sure you enjoy their display. It’s amazing. 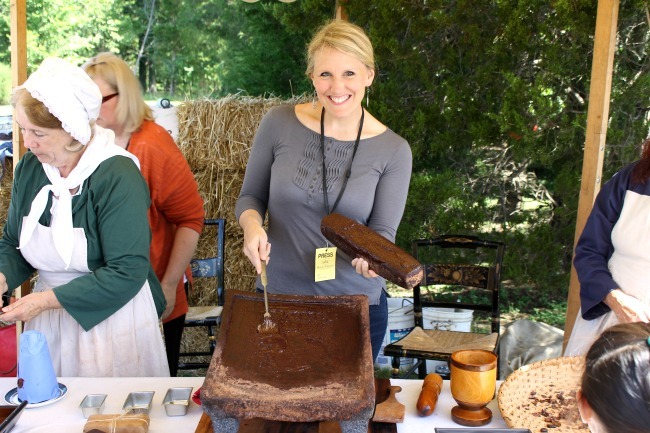 The ladies that were giving the history of chocolate making don’t get paid a penny. 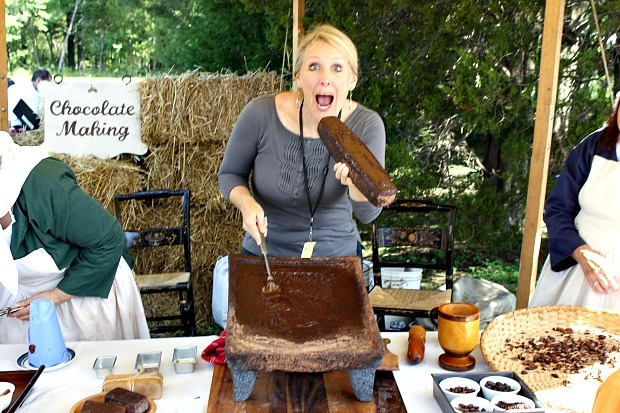 They are just passionate about sharing their love of chocolate history with others. In George Washington’s last chocolate order, right before he died, he ordered 50 pounds. That’s some serious chocolate and in those days, they drank it as a chocolate drink. My guess is that he was doing a lot of entertaining and hosting to necessitate that much. I can’t recommend visiting Mount Vernon enough. Since it’s so close to Washington D.C., this needs to be an addition to your bucket list. Our next generation of youth are slowly becoming historically illiterate and it’s critical for us to infuse a love of history in them so that they can understand all that has been sacrificed for them, thus remembering lessons learned for future generations. 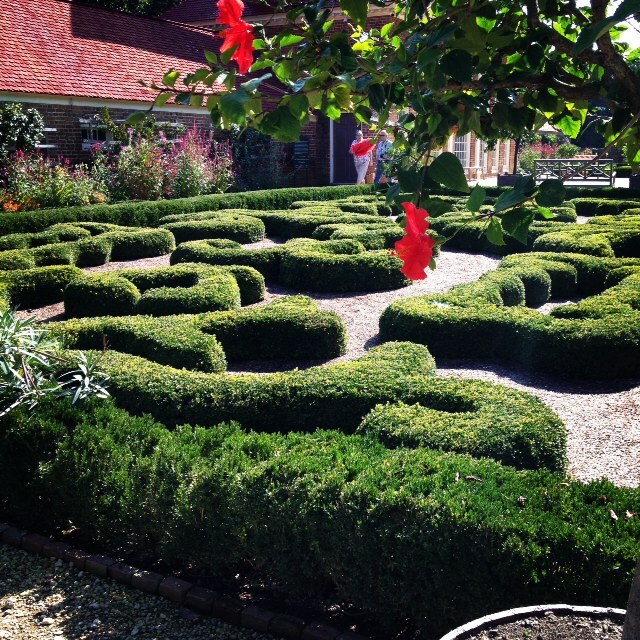 Have you ever visited Mount Vernon? What impacted you on your visit? This blog post is part of a paid SocialMoms and American Heritage blogging program. My love of history and opinions are completely my own. 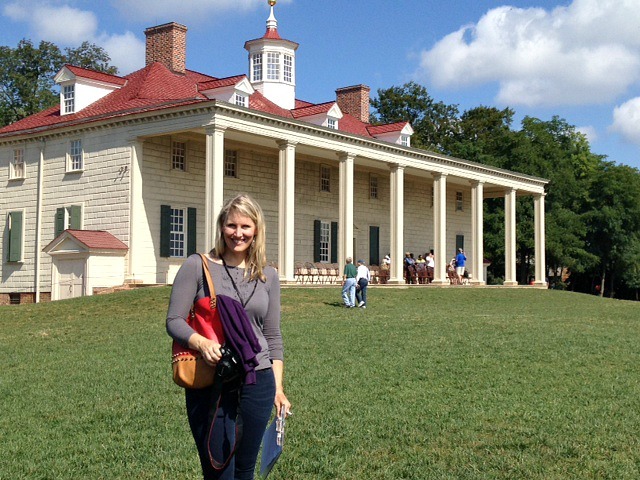 I actually worked at the gift shop at Mt Vernon during high school (my mom was also one of the lead tour guides). It was a fun place to work and since I already loved history it fit! Paige – you should DEFINITELY go back. It’s changed so much in just the last few year and that new educational center is out of this world. I think the Ladies of Mount Vernon raised something like 200 million dollars for all the renovations and it’s quite the experience. Love your pictures! I have been to Mt. Vernon once 14 1/2 years ago when I was 6 mths pregnant with my oldest–while my husband was in meetings. The day I was there the meanest school teacher had her class there and yelled at them the entire way through the house and was even yelling at me. To say the least, I am looking forward to going back this coming summer with my family! 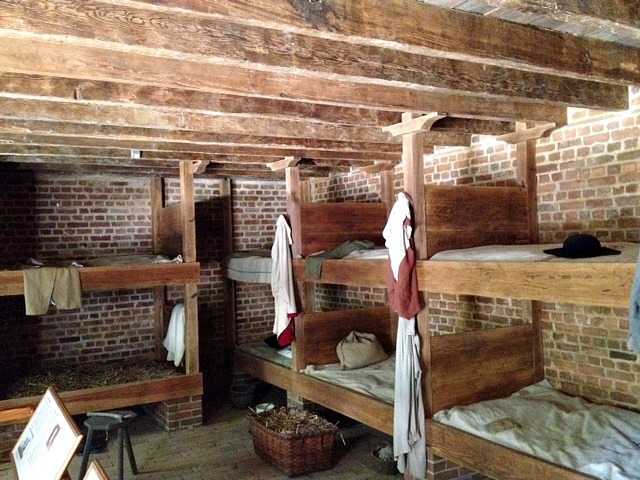 I loved the living history bits, like the kitchen and the farm. Also, an actor playing Mrs. Washington held forth for hours, knitting away, and answering questions in character. What a wonderful historian she was, with an encyclopedic knowledge of the era and the Washington family. It was very interesting. The chocolate bit must have been incredible! Lucky you, love the pictures. I missed Mrs. Washington. I would have LOVED to have heard her. I went there when i was 17, over 30 years ago. Now I have a daughter living in VA, I want to go again. I have read several books about the founding fathers and George Washington in particular that have increased my love and appreciation for this great man. I especially recommend that anyone who wants to understand our first president read His Excellency George Washington by Joseph Ellis. 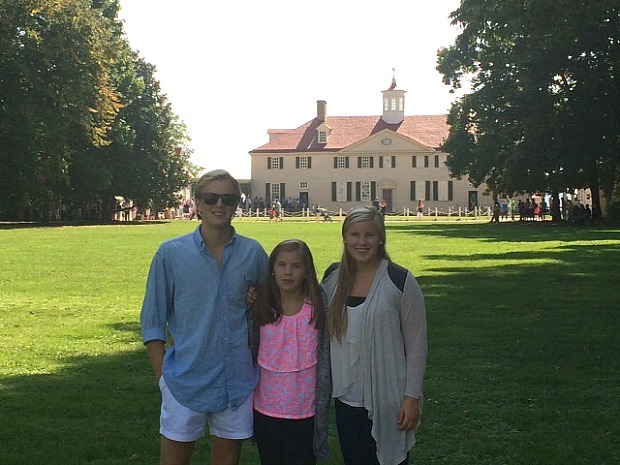 As our family slow travels the country focusing on American History & civics, we often talk about our weeks last summer/fall in VA visiting Monticello, Mount Vernon & Colonial Williamsburg, where we were first introduced to their chocolate! So complex and aromatic, we purchased two big boxes of chocolate sticks. Mount Vernon was holding their colonial marketplace during our visit. Timothy the weaver had my boys captivated for over an hour…so long that we missed the one thing I most wanted to see…the chocolate demonstration! How gorgeous the parlor turned out. We saw it as restoration work in progress and knew it was going to be dramatic just seeing the wall color! Your interior photos are amazing! I am so glad you got to visit during one of the marketplaces. That really makes for an even more special experience, doesn’t it? But you missed the chocolate demo? Oh bummer, well you can kind of see it through my posts. HAve you baked with the chocolate yet? It’s so rich for me to just eat “as is” but using it in baked goods really adds a new layer of flavor I can’t get with just chocolate chips or something.